Mary George knows about happy accidents. 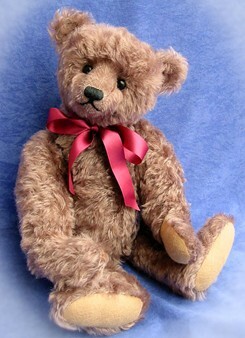 Her encounter with one, turned this wife and mother of three sons, into a seasoned and accomplished teddy bear artist. 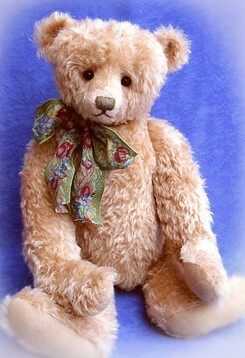 "I was drawn into the world of teddy bears quite by accident," she recalled. "One day I decided our family room needed some updating so I went to the local library to find some books and magazines about interior decorating." The decorating books were located next to books about antiques and collectibles. Upon a glance, her eye caught a book called “Teddy Bears Past and Present”. Picking it up and opened the pages, she was captivated by all the teddy bear faces looking back at her and she couldn’t put the book down. "I borrowed the book from the library that day and for the next several months I kept signing out the book just to able to look at all the antique bear pictures." 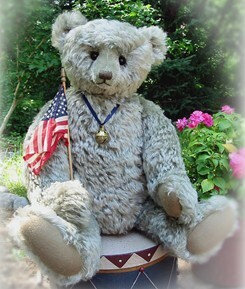 She'd made a decision that an antique bear was what she needed to decorate a chair in the room she was working on. But in her research, she found well-kept antique bears were difficult to find and her search netted her frustration instead. Her husband, Bill, noticed her frustration and asked her why she just didn't make a bear that looked old to sit in the chair. He knew that she had plenty of sewing talent. She'd grown up sewing all her life; from doll clothes during her childhood years, to sewing clothes and toys for her own children. Whenever she needed something for the house, she would make it. "At first I was a little annoyed when I heard this from my husband and part of me wanted to slap him for making such a ridiculous suggestion," she laughingly recalled. "But the more I thought about it, the more real and challenging the idea became and I decided that maybe I could make an old looking bear." Because it was the early 1990's, Mary researched patterns in the library, since the Internet was not yet widely accessible. 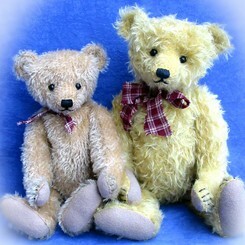 She bought some synthetic fabrics and through trial and error, designed and made her first bears. It was several months before she had designed a pattern that was in line with the antique look that she was striving for. She kept adjusting and working on her patterns. She wanted to maintain the classic features of the antique bears. "About a year later, I was back at the library to borrow the book again. The librarian checked the book out for me said she couldn’t help but notice that I had been borrowing the same book over and over for months and she wondered why." Mary divulged that she was trying to make an antique-style bear. At that, the woman became very excited and took Mary into her back office. It turned out she collected dolls and she showed her some of the dolls she had on display in her office. 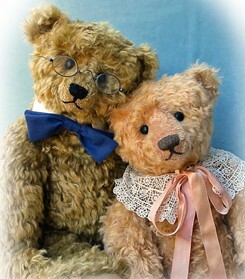 "She asked me if I would bring some of bears I had made to the library to show her. So, the next time I went to the library I took some of my bears. She asked me if I would consider selling her a couple so she could display them with her dolls." Mary was so surprised! She had never thought about selling them. The librarian bought the three bears Mary had with her and then a few days later the librarian called to say that other library clerks would like to buy a bear also. Mary's new adventure had officially begun. The library clerk suggested that Mary try selling some of her pieces at one of the local arts and craft shows. This is where she would meet her first teddy bear collector. "This collector told me she would love to see my bears made from mohair and she told me all about mohair, bear collecting, bears shows, and teddy bear magazines." 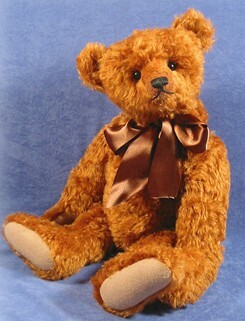 Mary located a teddy bear magazine a few days later, ordered mohair and signed up for her first official teddy bear show. 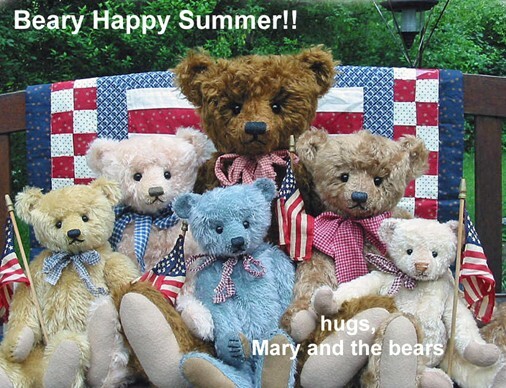 Mary's been making her bears now for over 17 years and when asked what she loves about it, she replied, "I hope collectors can tell that I love what I do and that each bear is very special to me. 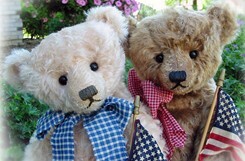 That by adopting one of my bears I’m hoping I’m making a connection with the collector and letting them know that they’ve made a new friend." Mary still loves the look of antique bears, so she doesn't make too many changes to the look that she's been trying to capture all these years. "I'm still not satisfied that I've got it exactly right yet," she said. 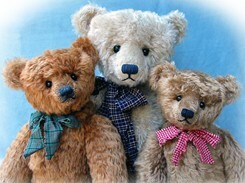 So she continues to hone the looks of her bears with each new pattern. Mary does have a favorite part of bear making. "I love when I get a call or email from one of my collectors and they tell me how much they love their newly adopted teddy and that he/she puts a smile on their face and makes them happy," she recalled, smiling. "I’m also very touched when I hear that my bears have helped someone get through a difficult time in their life." Mary has had several collector friends who have told her how they’ve been comforted by having one of her bears as they are dealing with a chronic or a serious illness. 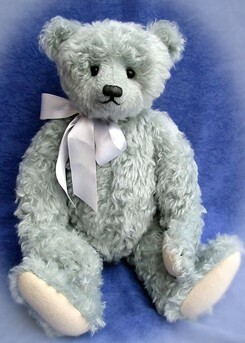 A particularly touching memory came a couple of years ago when Mary found out, a few months before Christmas, that the mother of one of her collectors had passed away before she had completed a special pink bear the woman had ordered as a gift for her daughter, who was one of Mary's collectors too. "My collector called to ask me if I would go ahead finish the bear for her as a last gift from her mom." She continued, "I finished “Teddy Rose” and sent her in time for Christmas. I was so touched when my collector called to thank me and told me receiving my bear made her feel like her mother was with her on Christmas day and my bear was a final Christmas gift from her mom." 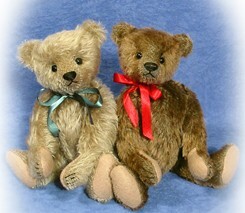 Just knowing that Mary's bears really mean something to others is one of the best things, she feels, about making them. Each of Mary's creations receives the same loving send-off before it is sent to it's new home. "The very last thing I do is to give the bear a hug, tell it to be a good bear, and wish it a good life with its new family." With each new adoption, Mary hopes to send a special message, similar to the message that the faces of old bears give to her: that we will all have experiences and stories to tell when we reach old age, so why not try to make sure they’re good stories, where the most important things we remember are the simple things we did in life; such as to comfort someone, to lend a helping hand to someone, to make someone smile--just like a teddy bear would do.